In Denmark Adventure! First of all I'd like to thanks Diyarbakır ÇEVKA to give me that opportunity to go Europe. It's my first time in abroad. Before having been called by the association I had been searching such projects and applying all of them but I wasn't accepted. Let me start with the meeting Turkish team in the airport. Because of the being in Ankara I had to stay at the airport for a night, by the way me and Hatice was in contact to not to get lost at the airport. First me and Hatice, then Ayşe and Halim arrived to airport. They were all very kind people and social ones. That's why we had no difficulty on having fun. Anyway, the plane took off and started climbing, meanwhile I was praying to God for giving me such a chance and not to crash and not to die before seeing Denmark. After 2 hours we landed in Copenhagen. That's the moment when my time started. I knew English yeah, having talked with foreign people and having friends from other countries. Howeveri I hadn't tried my English in a country full of natives of the language. After 2 hours of train we arrived Nysted, where we're told to be but what we saw was there were almost no one. We started worrying but then girls decided to make a phone call from one of the local’s phone. They knocked a door and stepped inside then the old lady came out and started to have chat with us in Danish but all we know was English so we couldn't talk but we made a connection with body language, really pure body language. Then we found another local and we asked her to use her phone in order to contact with authority. Then Cemil Abe came with Seda and picked us. That's when our adventure exactly started. The place we're going to stay was just a little bit away. There were about 50 people from other countries and it was big opportunity for us to know other nations. We were arranged a room with cemil and halim. To talk about the project and activities we did, it was really full of fun and love because you are with different people and different cultures and you have a chance of meeting their culture and games Such as arrow, or no touch games. I figured out that it's not hard as I thought. All of the people who were there were friendly and even with some of them you see that even mile between both of you; you may have a mutual idea, hobby, interests. For example, Vladimir is an aviator which is known as in love with aviation and me as well an aviator. Julian is someone with patience and funny like me. I met someone who is in the same department in Bulgaria. Coco as we called him, and tried to learn something from them. And also secret friend thing. Although I wasn't picked by any, when I gave gifts to the one I'd his name I was really happy because he was French and very kind person. Also, the last day, actually, there was I was in a sad mood because I had to leave and I'd started to get used to them. 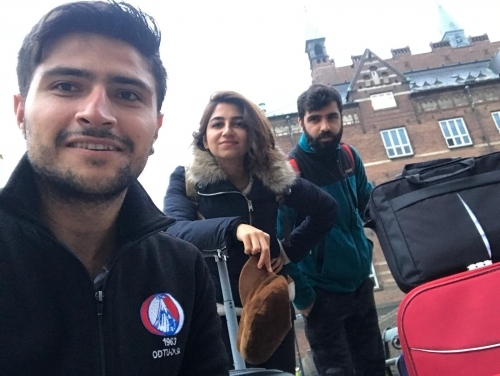 During the last day, as Turkish team, we spent almost all day and made a channel tour in which we had a chance of city sightseeing in Copenhagen by ship. We laughed about the sandwiches I did for my mates and they didn't eat, later on asking almost everyone to where to visit and encourage our friends who are afraid of speaking, it was really one of the best day of mine. To conclude, I really learnt many things I, kind of, enlightened. I'd like to thank again all of them and the association.